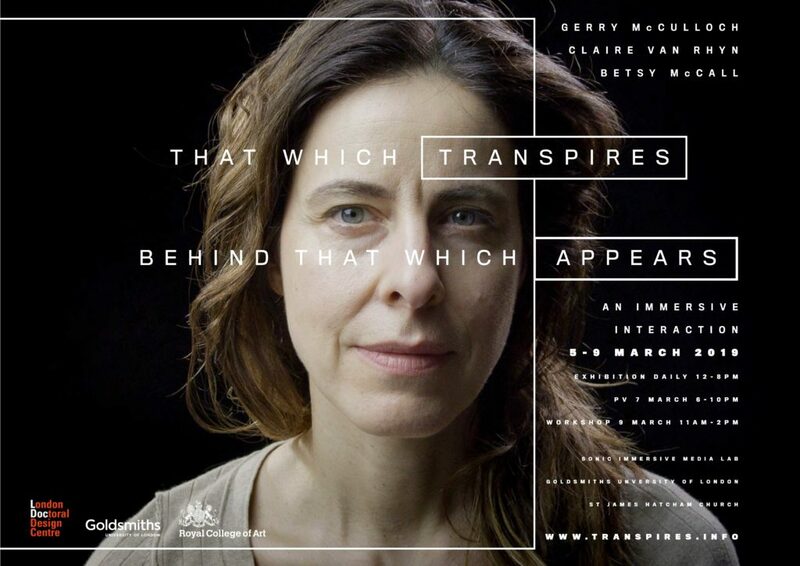 The Transpires exhibition and workshop showcases work by Art Monastery founder & social sculptor Betsy McCall, two-time Artmonk-in-Residence cinematographer Gerry McCullloch, and design researcher Claire van Rhyn. A cross-institutional event, the exhibition brings together the Art Monastery, Royal College of Art School of Communication, and the Department of Media, Communications and Cultural Studies at Goldsmiths, University of London. The Transpires exhibition and workshop is hosted in the interdisciplinary Sonics Immersive Media Lab at Goldsmiths and forms part of the MCCS department’s 40th year anniversary celebrations. The event is further supported by the Arts and Humanities Research Council, London Doctoral Design Centre. esign research and exploratory cinematographic methods. The show investigates pre-verbal communication, with a particular focus on bodied modes of interaction between individuals and groups. This joint exhibition juxtaposes the aesthetic dynamics of pre-verbal communication alongside research on the practical application of such bodied modes of communication. The workshop introduces a series of collaborative improvisational activities as a participatory means of exploring the communication of sameness and difference in groups.